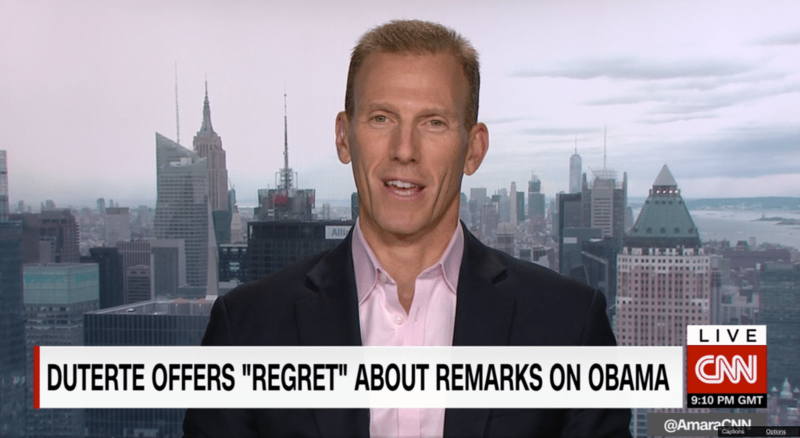 As I mention in my CNN interview from yesterday, President Obama’s trip this week to China and Laos has demonstrated the significant progress our country has made in Asia these past eight years… and also the great deal of work we still have to do. Working with China on climate change, the foundation of the Paris agreement, was no small feat, nor was the opening up of Myanmar, the rebalance to Asia, etc. President Obama will leave office with our country far better positioned in Asia and the world than when he entered. In Asia, however, Beijing’s extremely aggressive behavior in the South and East China Seas and its rejection the UN Convention on the Law of the Sea has frightened most of its neighbors and created a strong desire among many of them to hug the US far more tightly than before. Of course, sometimes hugs can get a bit awkward, which we saw in Philippine President Duterte’s extremely inappropriate and ill-advised comments. But while Philippine-US relations remain strong, dark clouds are forming in the region due to the aggressive behavior by China and North Korea. Even while the G20 meetings were going on in Hangzhou, a Chinese armada was forming in Philippine territorial waters that seems likely to start building another illegal military base in the South China Sea, this time on Scarborough Shoal. And by firing three missiles during the meeting, North Korea was making clear it believes China will not pull its plug of support no matter how Pyongyang behaves. As I’ve written before, a hostile nuclear-armed North Korea threatens China perhaps more than any other country. But only China can assess its own security needs. For now, China continues to see North Korea primarily through the lens of Beijing’s strategic competition with the US and is willing to accept (and implicitly support through continued trade and aid) North Korea’s threatening and extremely dangerous behavior. The good news is that America’s standing in the Asia-Pacific is high and rising and that it is looking increasingly likely (but we should take nothing for granted) that the next President of the United States will be Hillary Clinton, among the most qualified candidates in our history, who deeply understands Asia and has a proven track record of extremely capable decision-making.